On the Udi’s Gluten Free Community website, one of the naturally gluten free foods my fellow community leaders and I like to recommend to members is quinoa. It’s a terrific source of vegetarian protein, too. However, lately I’ve noticed that my kids don’t like it all that much. In fact, they tell me quinoa tastes kind of gross. One way I combat that is by rinsing the quinoa before cooking. Another thing I try to do is dress it up by combining it with salt, spices, and some veggie add-ins like diced roasted peppers during the cooking process. 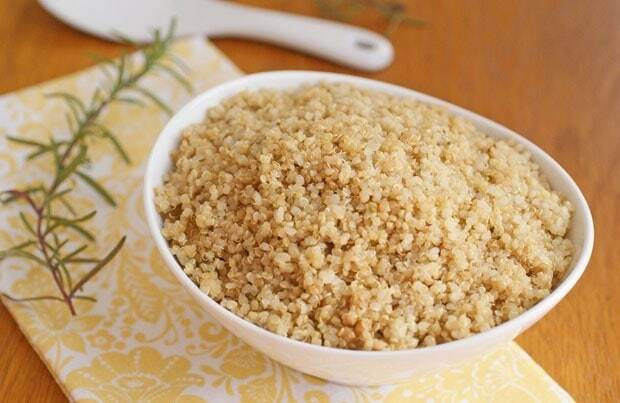 One successful quinoa recipe I regularly feed to my family is based on this recipe from Mizkan. Instead of couscous, I use quinoa (I use Bob's Red Mill Organic Grain Quinoa) and have adjusted the amounts of water and Holland House White Cooking Wine accordingly. It makes a great side dish when serving grilled steaks or smoked beer can chicken, and it makes great use of the rosemary we have growing in the garden. In the pictures, it’s hard to see the tiny bits of rosemary. Believe me, it’s there. Also, I checked the ingredients of Holland House's cooking wine, and it's gluten free, too. In a medium saucepan, combine all ingredients except for the quinoa. Cover and bring to a boil on high heat. Let boil for 1 minute. Remove cover, pour in quinoa, and replace cover. Bring back to a full boil, then turn heat down to medium low. Cook for 12 minutes or until all liquid is absorbed by quinoa. Remove lid, stir quinoa and serve. You can download a coupon for 50 cents off your next purchase of Holland House cooking wine here. Also, for more recipes using Holland House, sign up for Mizkan’s Splash for Cash e-newsletter for a chance to win up to $600. (Mizkan is Holland House’s parent company.) Finally you can connect with Holland House on Facebook. Disclosure: As an Udi's Gluten Free Community Leader I'm compensated for my time and efforts on their behalf. Mizkan, the parent company of Holland House, provided compensation for this post. All opinions and experiences are my own. Amazon links are affiliate links. A commission may be earned from a referred sale to their website. This looks lovely and delicious- a winning combo! That looks delicious. I love rosemary. Thanks for sharing! 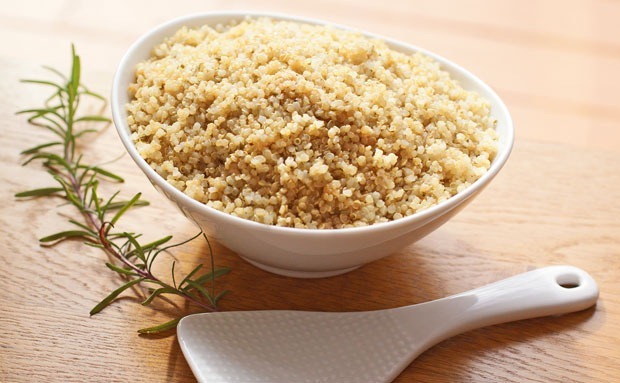 I’ve been looking for more recipes with quinoa – thank you!